I finally found the absolute best kitchen sponges… ever! Honestly, I never thought kitchen sponges mattered all that much to me. I’ve been using the same brand of sponges for years — until recently. I used to use the blue Scotch-Brite sponges. I still like them (especially for kitchen dishes) and I think they’re the best non-scratch sponge that you can easily find in most stores, but they tend to hold in all the smells, food, and grease. This makes them fairly expensive for disposable sponges that don’t last very long. Each blue Scotch-Brite sponge typically lasted a couple weeks in my kitchen before I needed to throw it out — a month tops, if I took extra steps to disinfect it when it got too grimy. Now I use microfiber sponges. On one side is a soft cloth-like microfiber material that cannot scratch any item in any way. On the other side is a diamond-fiber surface that is abrasive enough to scrub stubborn burnt-on foods without scratching kitchen surfaces — including non-stick surfaces inside of pots & pans, the glass stovetop that typically requires a ‘specialized cleaner’, and everything in between! My microfiber sponges (which are similar to these and these) are also a little bit bigger than the blue Scotch-Brite sponges. I never realized how much I would appreciate that! They fit better in my hand. They require fewer swipes to get items clean. They still fit inside the same sink-side sponge holder that I’ve always used. In addition to the microfiber kitchen sponges that I use every day to clean my countertops & appliances — and wash all of my dishes — I also have one super scrubby non-scratching sponge that I keep near my kitchen sink day in and day out. Since I use this sponge solely for removing greasy, cooked-on or burnt-on foods, I don’t use it in the one cool way that I thought I would: to clean the inside of cups and glasses. In our house, I need a super strong scrubber much more often than I need something to clean the inside of cups & glasses with. For what it’s worth, I sometimes use a blue Scotch-Brite sponge as my scrubby sponge for greasy items IF I don’t happen to have another Scrub Daddy sponge on hand when I need it. But truthfully, the Scrub Daddy actually scrubs better and it doesn’t hold in any of the smells, food particles, or stains like a blue Scotch-Brite kitchen sponge does. Plus, the Scrub Daddy sponge fits nicely over the handle of my kitchen faucet, whereas I’d need to place another sponge holder inside the sink if I regularly used the blue Scotch-Brite sponges for this purpose — because they need a place to dry out in between uses. Before, when I was using the blue Scotch-Brite kitchen sponges, I would clean and sanitize each one when it started to get grimy after using it for a week or so. Then, after sanitizing, I’d usually get another week or so out of it before I finally had to throw it away. These days, with my 10-pack supply of fully washable microfiber kitchen sponges, I keep rotating the sponges every week, and I haven’t had to throw one away yet! I always hand clean — before I sponge clean — my greasiest, dirtiest pots and pans. I set aside one ‘special’ sponge (the Scrub Daddy sponge, mentioned above) for use on all of those greasy, burned on food items — so my everyday kitchen sponges aren’t being used on the most challenging kitchen cleaning tasks. 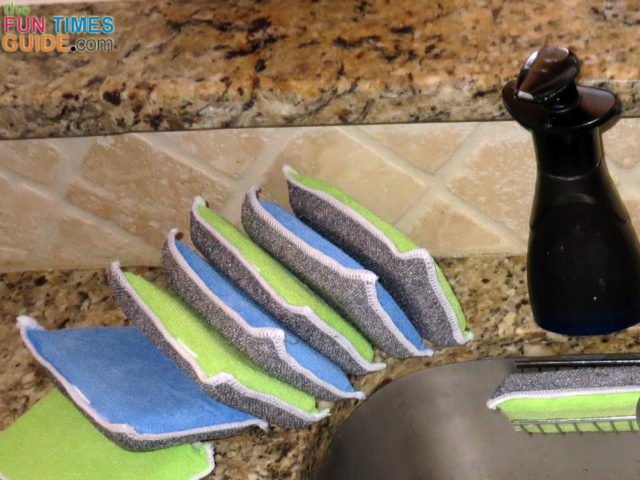 I use microfiber reusable sponges for everyday dishwashing and countertop cleaning. 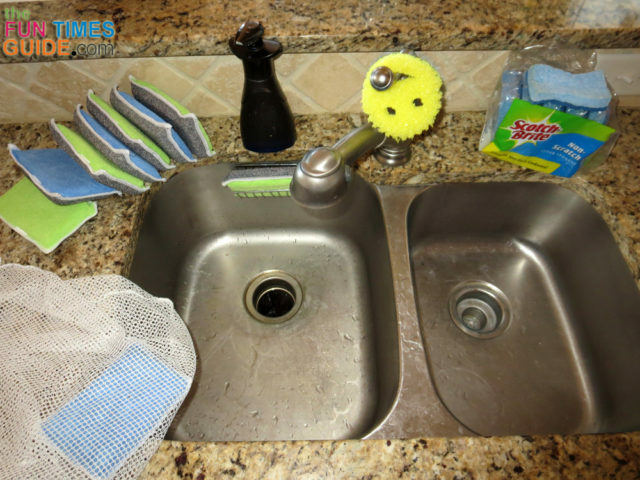 I clean my kitchen sponges almost daily — it only takes 2 minutes! I always wring most of the water out of a sponge before letting it air-dry. Use your hands to rub the soap over all of the greasy, grimy spots in the pan first, then use the Scrub Daddy sponge (if scrubbing is necessary). Repeat Step 2 if necessary, until the pan no longer feels super greasy to the touch. Finally, use the microfiber kitchen sponge — and a little more soap — to fully clean the pan. Wah-lah, the pan is clean and the microfiber kitchen sponge isn’t greasy and packed with grime. Best of all: we haven’t used a ton of soap to get the job done! I have 10 microfiber sponges that I rotate through. As a result, I am never without a clean kitchen sponge whenever I need one. Then, after about a week, it gets tossed into a lingerie bag and goes into the washing machine with a load of towels using hot water. After that, while it’s still wet, it gets a quick 2-minute zap in the microwave and is left to air dry in the laundry room. Then, it goes back into the rotation with the rest of my kitchen sponges. The microwave method kills 99.9% of bacteria from sponges. The dishwasher method alone kills 99.9% of bacteria from sponges. Soak your sponge for at least 5 minutes in a solution of 3/4 cup bleach to 1 gallon of water. Best of all: If you mix the bleach solution in your kitchen sink, then you’ll be cleaning and sanitizing your sink at the same time! The bleach method alone kills 99.9% of bacteria from sponges. This one’s easy… and environmentally friendly! Soak your sponge for at least 5 minutes in full-strength white vinegar — overnight is even better. Then, let the sponge air-dry — in the sun, if possible. The vinegar method alone kills 99.6% of bacteria from sponges. What About Tossing Sponges In The Washing Machine? When I first bought the microfiber sponges, I had planned for the washing machine to be my primary method of cleaning and disinfecting sponges. The manufacturer’s own cleaning instructions are: hot water, no bleach, no fabric softener, and low-heat dryer. However, after a little research, I learned that while the washing machine may be good at cleaning microfiber sponges, it’s not very effective at sanitizing sponges. So that’s why I nuke ’em daily, and then machine wash ’em weekly. The washing machine method alone kills 93% of bacteria from sponges. According to the manufacturer, they can safely be cleaned in the washing machine or dishwasher. Whichever type of kitchen sponge you prefer, always wring it out the best you can after each use. That way, it will dry faster — giving bacteria less opportunity to grow and thrive.